Takes less than 3 minutes! Download the HP50g ROM update. Copy the files: ???? ?.bin and update.scp that should be located in the zip folder into a SD card formatted in FAT File System (not FAT32). On the calculator, Press and hold the + and - Button and press on the RESET button using a paper clip or other blunt object. Release the RESET button, wait 2 second and release the + and - keys. Your calculator screen should display the update and self test menu. Insert the SD card (upside down) in the calculator. The calculator should start updating the ROM (you will see flashing messages telling you about the update process). This should take around 1 minute. When the upgrade is finish (the calculator displays: "Update Finish, waiting for reset"), press the reset button, your calculator has been upgraded. On Step 7 if you get the message "NO CARD, OR ERROR", your SD Card maybe a capacity that is greater than the calculator (with boot version 3.19 or smaller) can handle or SD is not formatted to FAT File System. Try using a smaller capacity SD Card or reformat the card to FAT File System. Read this posting. Right click on the removable disk. 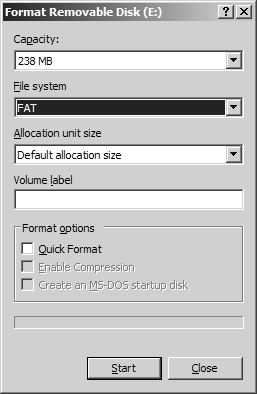 On the Format Removable Disk Dialog, change File System to "FAT". This procedure is applicable for HP49g+. Work only with 256MB sd card. Where to get this kind of card nowadays? I have attempted twice to upgrade ROM v 2.15 after emptying the flash memory and formatting the SD Card and received error message "insufficient memory". What should I do? Hi, you should try using a lower capacity SD card like the 1 GB. It has been reported that the newer higher capacity would get an error and that it does not support the newer SDHC cards. Is it permissible to update ROM v2.15 more than once if for any reason I have to empty the Flash memory and format the SD Card ? I don’t think that there is any issues. Using my calculator he crashed and went into a state of "Try to recover memory? ", Did ja till update to 2.15 ram, and nothing makes exit this screen, the ultimate in making and changing the screen hp. Someone has gone through this and had a solution? Try pressing ON key and F3 simultaneously. Hold for two seconds, then release them. This will reset the 50g.